A carriage clock is a small spring driven clock, designed for travelling and introduced in the early 19th century by Abraham Louis Breguet for Emperor Napoleon. The case is usually plain or gilded. The movement is regulated by the platform which sits on top of the movement which is visible through the glass on the top of the case. They run for eight days with a single wind and have a beautiful tickling sound. They are basically in traditional designs and their design has changed very little from the original design. Investing in an antique carriage clock is a worthwhile investment as you will enjoy it for a long time. They will often have the makers name to show quality. Case finishes vary from gold to brass and chrome, they are all easy to maintain and keep clean. Carriage clocks also have different sizes from the largest, standard and petite carriage clocks. Antiques talk about your authenticity and your desire to be surrounded with quality items. They are made to last and can be passed down from generation to generation. An antique carriage clock with a case design and a traveling case to store the winding key is quite pricey. The original key should be matching numbered. 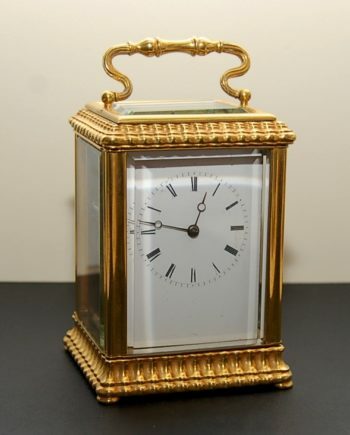 •	Victorian gilt carriage clock – This has a gold plated casing made by the French maker EGL. 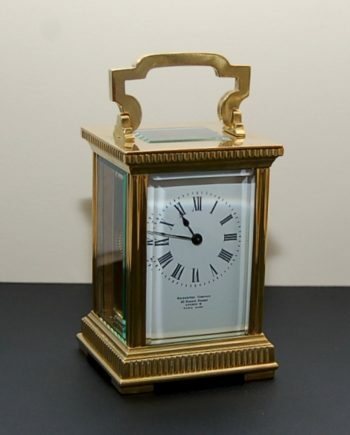 •	Brass repeater carriage clock – This has an eight-day timepiece mechanism and has a brass case. It has the makers mark and when the hand reaches the hour mark on the dial the repeater button makes a sound. •	French carriage clock – Has a floral center and a concave base molding, includes eight-day timepiece mechanism and with a repeater feature on top of the clock. 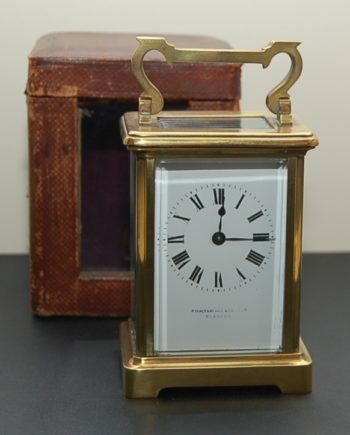 •	French striking carriage clock – produced in the 19th century, it has eight-day timepiece mechanism that strikes every hour and half hour and with a solid carrying handle. 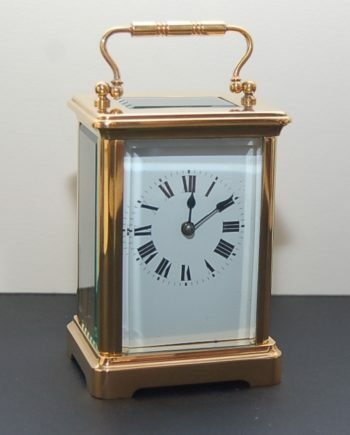 •	Quartz Carriage Clocks – produced in the 20th century. They were considered a great leap forward in technology. It is powered by a battery and a quartz crystal which oscillates at a fixed frequency so you never have to wind them. We have an ongoing variety of antique carriage clocks for sale from different makers and from different countries. We are more than happy to give you exactly the type you want but if we don’t have it in our store, we will source it for you. We are located in Perth, Australia. We supply both nationally and internationally, to places like New Zealand, Italy, Spain, UK, and the USA.